Guiding question: What is Germany (Deutschland)? 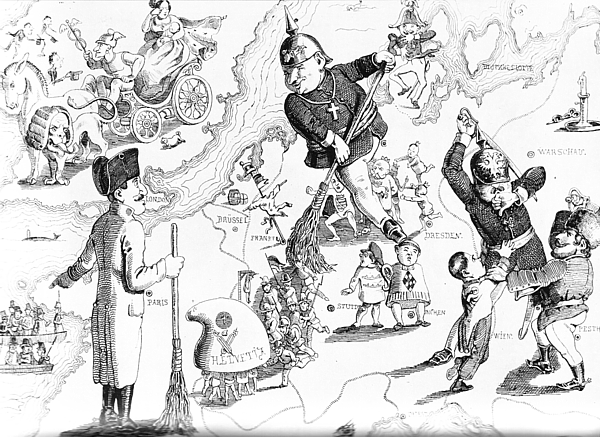 This lecture gives an overview of the broad arc of "German" history, from the time we might first speak of a German state in the early middle ages, until a consolidated modern state emerged in the late 1800s. My main purpose is to show that over history there have been many ways of defining the state we now call "Germany." Various peripheral territories come and go over time, depending on the domains of the dynastic leaders in control, and on the language/culture of the peoples (majorities) living in different regions. [note: since the digital projector wasn't working, I did not show the images until Friday's lecture. "Today, however, we have to say that a state is a human community that (successfully) claims the monopoly of the legitimate use of physical force within a given territory. Note that "territory" is one of the characteristics of the state." 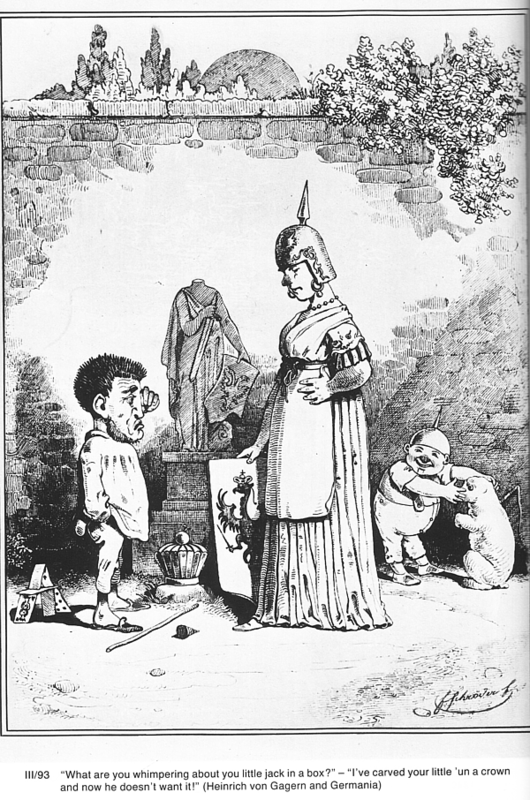 "L'etat, c'est moi"--"The state, that's me"
An Empire: collection of kingdoms, "principalities," etc. 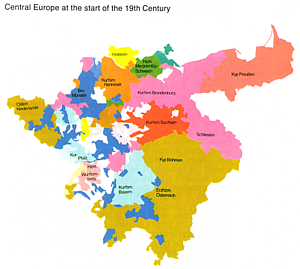 1356 bull established 7 electors: Count Palatine of the Rhine, King of Bohemia, Count Palatine of Saxony, Margrave of Brandenburg, and Archbishops of Köln, Mainz, and Trier. 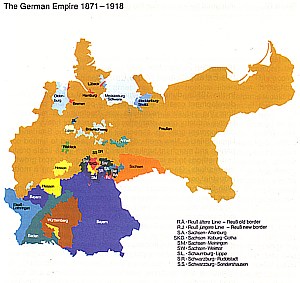 How did "Germany" get from the defunct Holy Roman Empire to the 1871 Wilhelmine Kaiserreich? 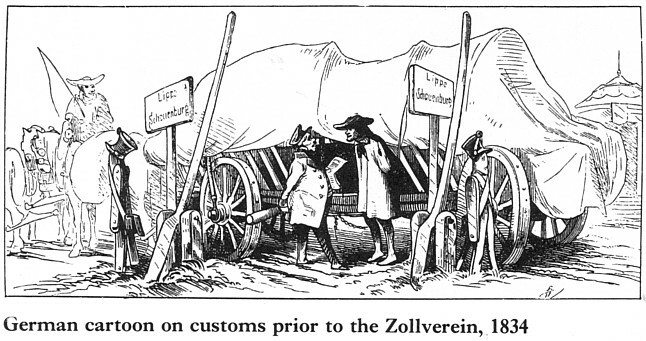 Important Point: haphazard, contingent way that central European pricipalities became "Germany"
The Customs Union (Zollverein), completed in 1834, enabled economic development. Refuses "Never must a scrap of paper come between me and my people"
Democrats being swept out of the German lands after the failure of the 1848 revolutions. 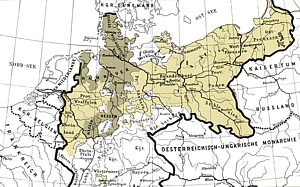 Friedrich Wilhelm IV doesn't accept the crown offered by the Frankfurt Parliament. 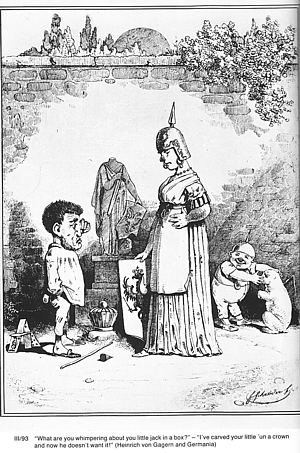 The cartoon shows the allegorical Germania reprimanding the democratic leader Heinrich von Gagern: "What are you whimpering about, you little jack in the box?" to which he replies: "I've carved your little one a crown and he doesn't want it!" 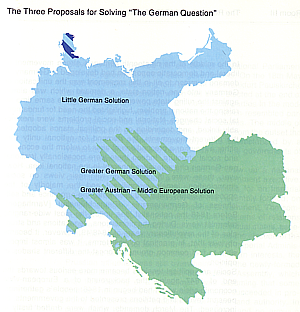 Large, medium, small "solutions" to the "German question"
The process by which Germany unified during the 19th century is often referred to as Germany's "Special Path" (as compared to Britain or France, where bourgeois revolutions "from below" constituted the nation-states. That will be the subject of the next lecture. 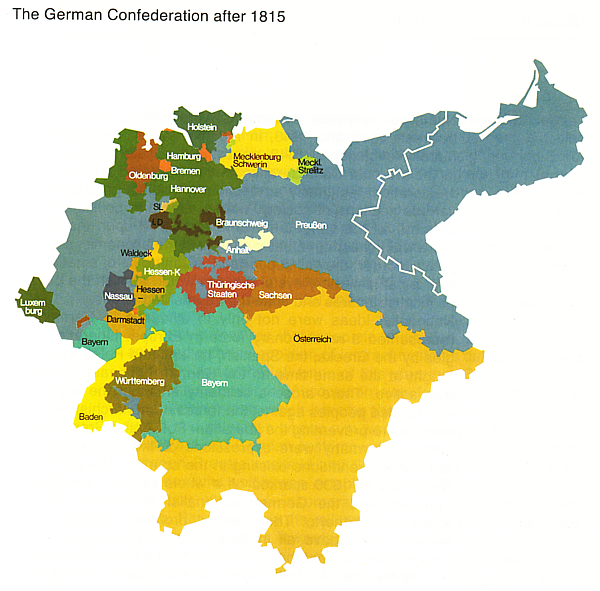 lecture 1: Introduction; lecture 3: Germany's "Special Path"